You see the person who cut you off on the freeway as the physical embodiment of Satan instead of just a jerk who is in need of God’s love. “Make allowance for each other’s faults, and forgive anyone who offends you. 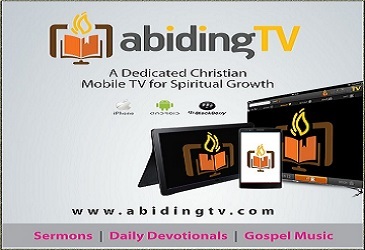 Remember, the Lord forgave you, so you must forgive others” (Colossians 3:13 NLT). 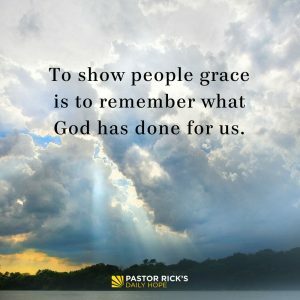 Do you show people grace? It’s what God wants us to do, but it’s not always easy to remember to do because we are so often focused on ourselves. It’s easier sometimes to be selfish instead of gracious. You see the slow checker in the grocery store line as a five-minute interruption to your day rather than somebody who might be struggling to keep his job, somebody who just got the worst news of his life a few minutes earlier. You see the one in your family who’s struggling right now as a drain on you rather than seeing her hopelessness over a desperate situation. You see the person who cut you off on the freeway as the physical embodiment of Satan instead of just a jerk who is in need of God’s love. We are all jerks in need of God’s love. That’s why Jesus Christ came into this world. And to show people grace is to remember what God has done for us. The ultimate way God shows us grace is by forgiveness. And the ultimate way he asks us to show grace to other people is by forgiving them. Colossians 3:13 says, “Make allowance for each other’s faults, and forgive anyone who offends you. Remember, the Lord forgave you, so you must forgive others” (NLT). People often ask me, “How can I find the strength to forgive? I don’t have it in me.” I don’t have it in me, either! The only place I’ve ever found the strength to forgive is to remember how much Jesus has forgiven me. When I remember that, then he gives me the strength and grace to forgive others. What do you need to forget? If you don’t forgive, you’re not going to enjoy God’s vision for the rest of your life, because forgiveness will keep you stuck in the past. You need to forgive for your sake, and then you need to get on with your life. Forgiveness is not saying that what somebody did was right or that there shouldn’t be consequences for what happened. It just means that you let go of your anger and hurt and give it to God so that you can move on with God’s purpose for your life. When that seems impossible, when you feel like you can’t be gracious toward someone, just remember one thing: Jesus forgave you. Remembering the grace God has shown you will give you the strength to be gracious to and forgive others. How does forgiving someone affect the other person? How does it affect you? What do you need to let go of so that, with God’s help, you can forgive and show grace to someone? How do resentment and bitterness keep you from fulfilling your purpose?